Seriously awesome. 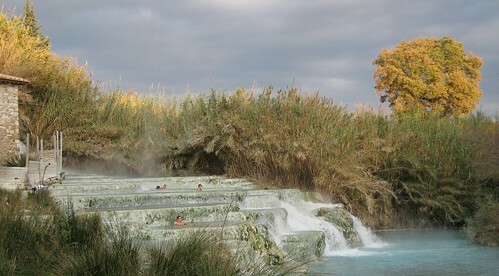 Just down the road from the Terme di Saturnia resort and spa ($20 / day, herbal perfumed four hand massage, probably something with cucumbers) is the free Saturnia hot springs, in use since the Roman times. 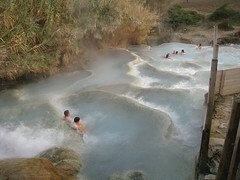 Who needs to pay for a massage when the beating of the hot waterfall on your back is enough to knock you down the river? It wasn’t perfect of course: the water was pleasantly warm, but not really hot (about 98°), there were mysterious clumps of toilet paper on the far bank and the aforementioned sulfur smell stuck with us for literally days, surviving multiple showers, but it was mild and not unpleasant. And really, what a nice reminder to smell Michelle’s hair and think "ah, Saturnia!"